I do not remember much. Only a couple of masked men, who barged into our office. And then suddenly, we were all here. In the middle of the wilderness, that stretches wherever we look. All it took only two days, before friends and coworkers became rivals. Water is little, there is no food and danger of wildlife threatens us from all sides. I think, that we will have to leave soon. Waiting does not make sense. I wonder, where to go and how to lose the others. They pose a threat to me. Actually.. I will be going out by myself tonight! Loneliness and fight for life. 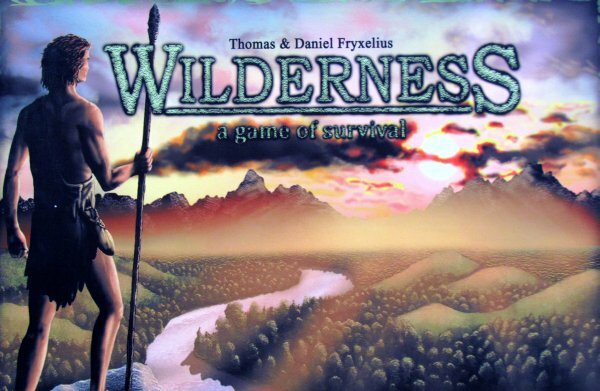 That´s exactly, what awaits us in board game Wilderness, which was created for us by brothers Thomas and Daniel Fryxelius (the latter did also the illustrations) under the auspices of their family publishing house FryxGames.You will certainly remember their interesting games Brawling Barons (review) or Space Station (review). Wilderness was there, at beginning of all in 2011. Not very deep, but quite a large box does not emit as much helplessness as it could. We see a courageous man peering down the river, which is winding into the distance. An apparent idyll. But not if you are accustomed to civilization, where everything is at reach of a hand. You are not ready to tackle disease, hunger and animals with your bare hands. 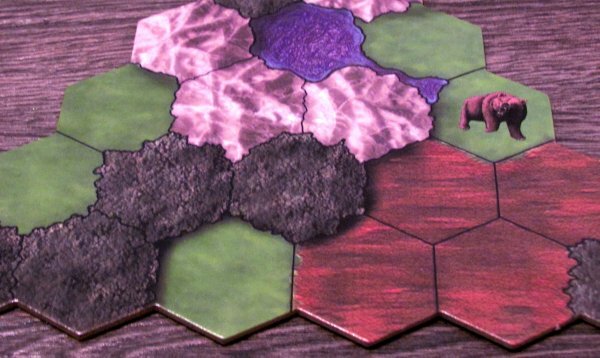 Inside the box, there are eight large triangular boards, each composed of 21 hexagonal areas, that represent one of the possible terrains – rocks, forests, swamps, deserts and lakes. The only this, our survivors will not encounter is snow. 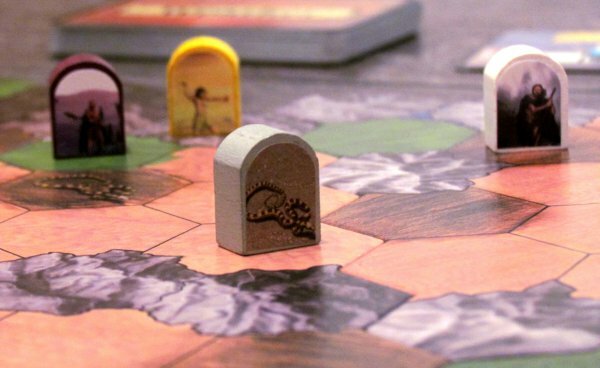 These boards also includes several additional tokens of the same shape, which also contain village, which is goal of all men in this game. 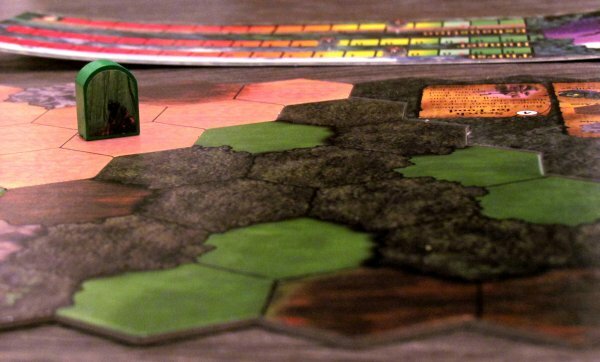 Two corner boards make our adventure world complete and close it into a rectangle. These two side boards contain help and compass, which has to be assembled with its plastic hand. 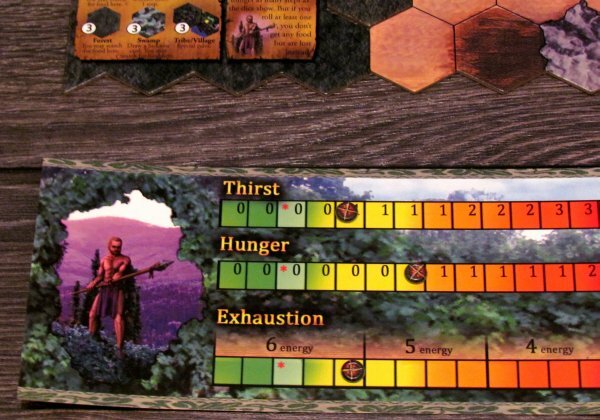 Each player should have one board with a portrait of his hero here, each containing three scales – thirst, hunger and exhaustion. 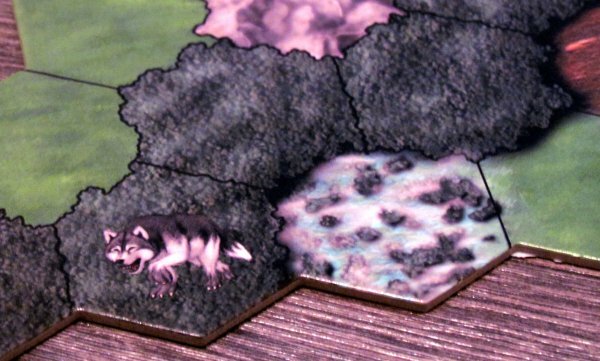 Packaging also includes six wooden figures and some animals, particularly snake, bear and wolves, that players get ready by putting stickers with images on them. Players also get pile of tokens to mark various scales, two dice, but also a deck of cards. There are events, but also diseases and weather. This means a total of three decks. 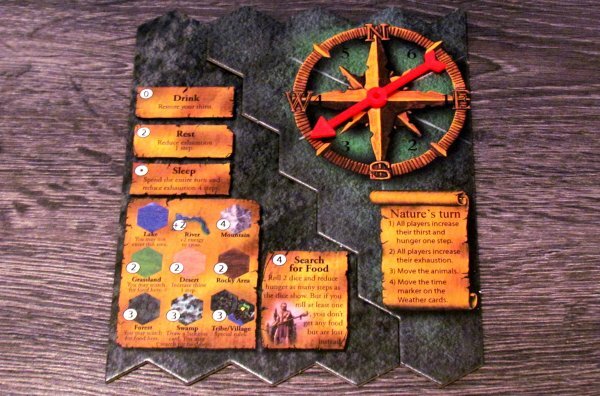 At the beginning of the game, players will establish a world of six randomly drawn triangular boards. These triangles are connected to each other (turned face down for now) as teeth, creating a long map standing between abandoned heroes and their salvation. Both sides are then finished by placing side boards with a compass and village token in most distant corner near it. Players can now choose their heroes, take their board, pawn and three tokens, which mark initial states of all three needs. Each player gets three cards from a shuffled deck of events. Their characters are starting at the farthest point from village. This is also the only part of the map, which will be unveiled for the time being. 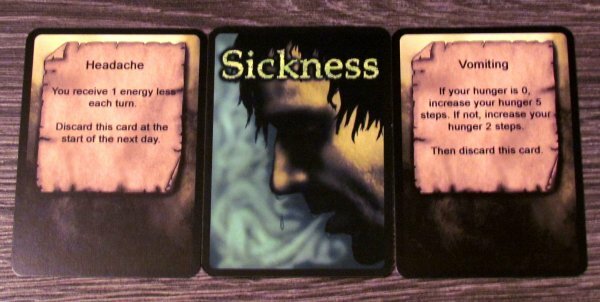 Deck of disease cards is shuffled and placed beside board. The same fate is waiting for weather, but from which the upper card is turned. Its effect is evaluated and time marker is placed on it. Each round of the game is equivalent of four hours of real time. 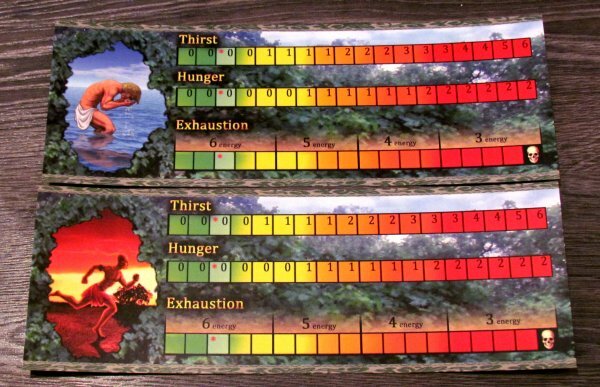 And because each weather card has six positions, it corresponds to one day (two fields have a deep blue color, which means sixteen hours of light and eight hours of darkness), where players have to survive in the wild. In his turn, player has always a certain amount of energy to spend for taking actions. Number of points depends on their exhaustion. While utterly fresh character has six points, with exhaustion this number may drop to three. With their points, players can naturaly move. But entering new space does not cost only one point, even comfortable walking on the grass, rocky and sand is worth two. Once hero enters trees or marsh, energy requirements start to grow. Another possibility is to search for food, but this can be done only during daylight. It costs four energy and can be done only in specified terrains. Now, dice are used and sum of their values corresponds to acquired amount of food. But players have to watch out! If they roll number one on any of them, hero got lost while searching for food and loses the entire move without any benefit! In addition, his pawn moves to a random neighboring location. Therefore, it is advantageous to keep this action to the end. When a player arrives in a place, which contains or is adjacent to water surface, he can also use chance to drink. This activity does not cost any action points and hero satisfies his thirst to the maximum on his scale. Rest is also worth once point and such hero gets one point of exhaustion removed. Sleeping is more effective, but that fills entire turn, during which player can not do anything else (except drinking, which is free). During the game, players receive event cards according to how much weather card allows them. 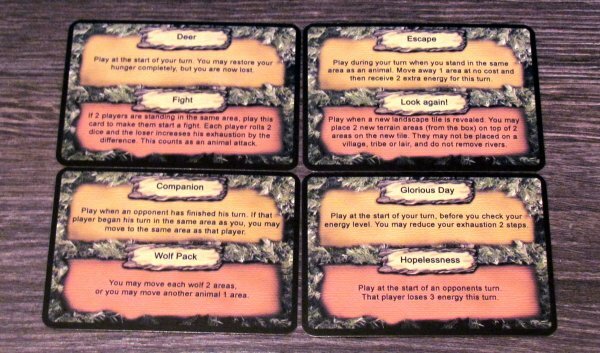 Such events can then be played at the time specified on the card, either for their own benefit, or for damage to the opponent (player has two actions to choose from on each card). Player can get sick either by event from any of his rivals or by visiting the swamp. At the end of each turn, players are waiting for nothing, but bad news. 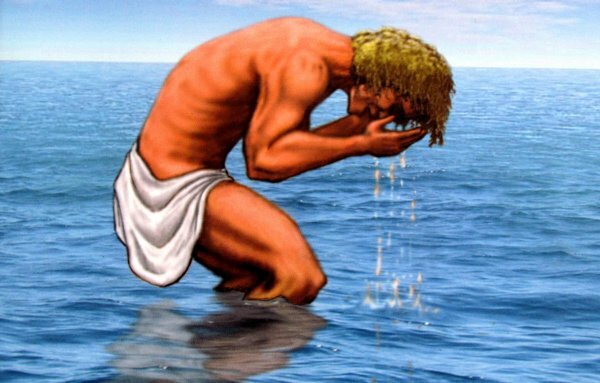 First, there is an increase in hunger, thirst and exhaustion. 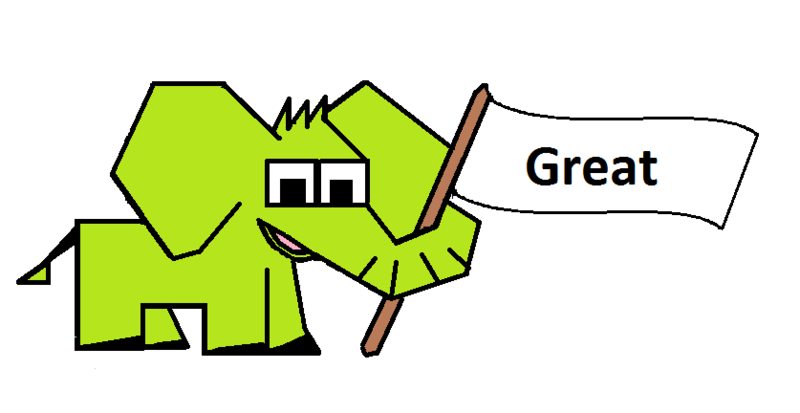 Then follows movement of animals, that can attack players are their movement is controlled randomly. Like all directions, this is done by compass. Player simply spins the arrow and wait, which direction is shown. Last action in one round is to move time indicator one space to the right or reveal new weather card. 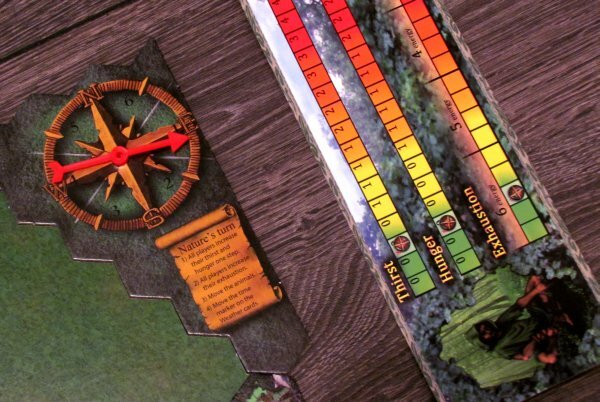 The game can end in player victory even before they reach village. 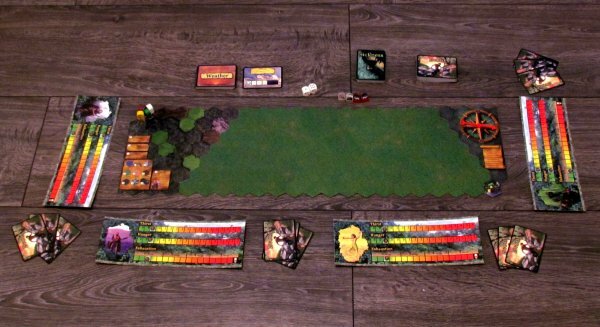 If everyone but one hero is exhausted and die (endurance scale on the player´s card has last box with skull on it), sole survivor immediately becomes winner. There can always be only one winner. In all other cases, player who arrives at the village first, wins. 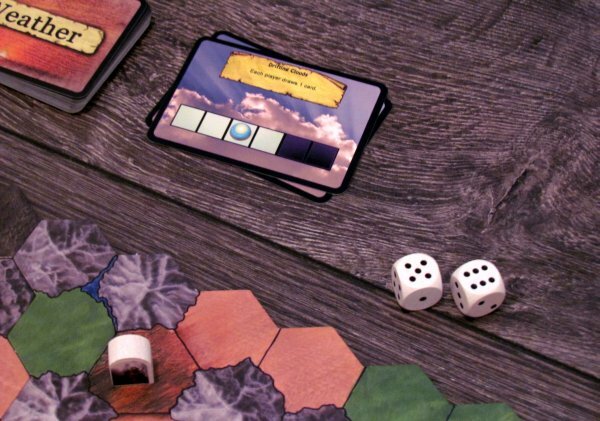 Wilderness is an excellent atmospheric board game. It offers beautifully elaborated topic survival, which puts emphasis on all the important elements. The game builds on the excellent research of unfamiliar areaa, which is always revealed as a whole and for all players. This means, that first player to explore new one has a disadvantage, because he is usually not on ideal track at that moment. First up, overall impression is clearly focused on atmosphere, that is excellent. Player encounter everything, they could really live trhough in an abandoned part of the world. And they must cope with it. Hunger and thirst forces them to take risk and change their route. Exhaustion is putting them further and further from their targets. The only element, that deviates from reality, is a race with others. This is no longer a question of survival and sometimes you simply move on at the expense of higher risk, because otherwise, you would drag behind. Element of time is also very well resolved in the game. There are even changes of day and night and they have an impact, as well as weather card itself, providing additional rules. Players then have the opportunity to help a little or harm others by correctly using events. These are generally interesting and give the game more tension, because you never know, what is coming in hands of your rivals. Only major drawback of this otherwise excellent game is players elimination. Teamwork of some bad events and one of the heroes is exhausted, that he could not continue. He dies alone in the jungle, and without any chance for the win. Its owner will have to wait for others to finish playing game. Fortunately, this problem is not as significant, because individual matches do not last as long. And the elimination of players will be more likely to happen in second half of the game. One game will normally take reasonable sixty minutes of your time, sometimes less (in two and thirty), sometimes a little more (more opponents). Likewise, two player game does not has any problems with player elimination. Even so, exploration and survival is fun. In more opponents, game becomes even more interesting, because lead is constantly changing. 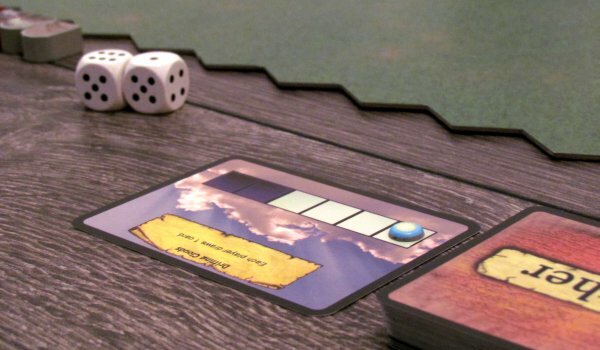 With simple rules, it can be played by children from ten years old, and leaving aside the relatively uncompromising topic, it could almost be marked as a family game. Individual matches differ from each other greatly. 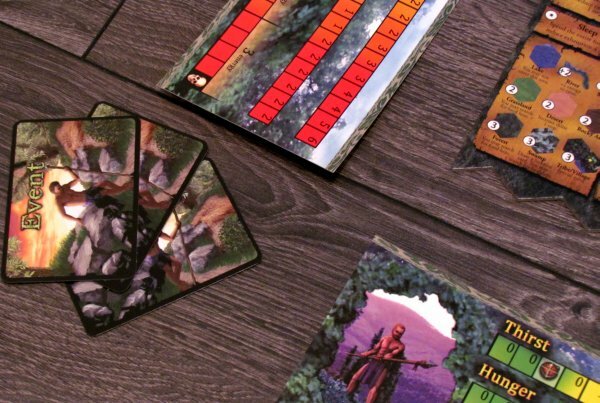 It is not only because of variable game boards, but also randomly drawn cards. You may consider, that in one game adventurers are dying on a daily basis, while other times village can be reached by anyone. But one thing is always true – players must be ready for everything! Game has obviously a big influence of luck, which is determined primarily by compass arrow of getting lost or when animals need to be moved. 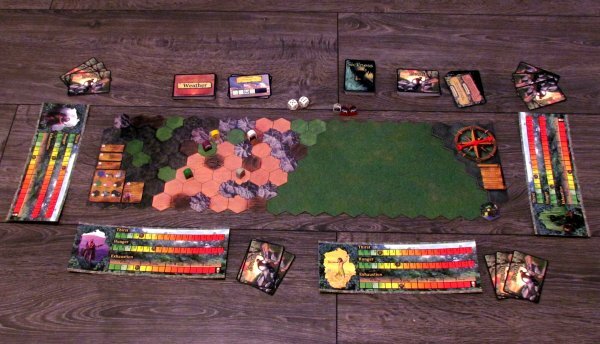 Mostly, however, players can avoid these problems with good planning. Actual processing of the game is good. 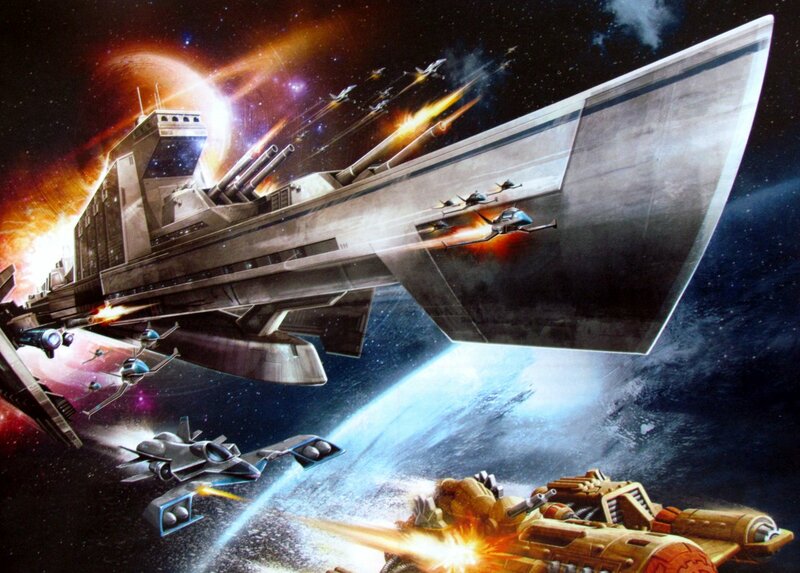 Whether we are talking about quality of the components or illustrations. The rules will not let you down, are balanced and clearly explain everything you need. Overall, it is therefore not much to criticize, because pieces are nice after applying enclosed stickers. 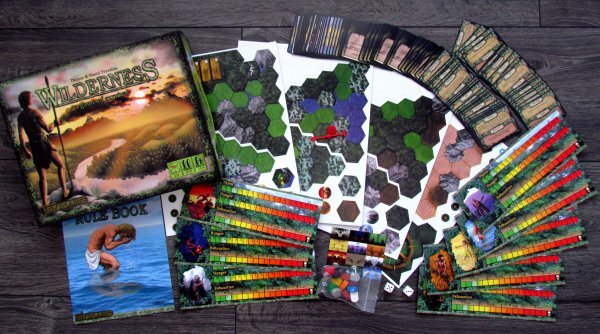 Wilderness is an excellent board game, that tells a story of survival. Players play a major role in it and must grapple with the will of nature, including alternation of day and night, which significantly affects their chances. The game provides a great experience every time, although sometimes players can get out of the game a little early. 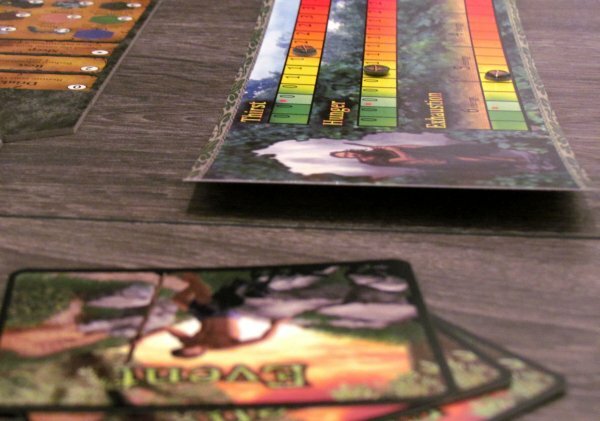 Overall, Wilderness is great fun for all without distinction – both for those, who like a little unpredictable games, and those, who prefer to plan carefully. Wilderness is a struggle for survival. Do not even think about it, it is a reality. And you as one of the castaways must stand up and despite hunger, thirst, disease and dangerous animals get first to inhabited village. The game contains elements of exploration and events, which can affect gameplay in both directions. Tensions will accompany you from beginning to end, when you try staying alive before reaching your destination (ie .. your character). The game offers a great atmosphere wrapped in a friendly game time. 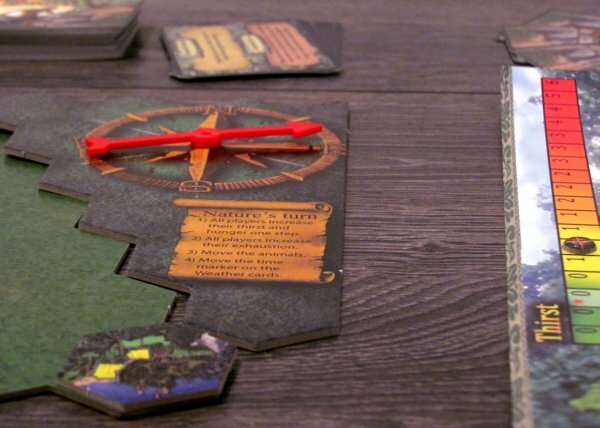 The whole thing is accessible for beginners, but game is great fun for everyone, regardless of age and boardgame religion. Wilderness simply hits the mark!